I’ve already talked about my immigration to NBC’s The Voice from FOX’s American Idol, but I’m still watching the latter and as The Voice moves out of those awesome auditions and into a format far more similar to Idol‘s Top 10/11/12/13 format, the competition between the two is getting at least a little bit closer. So I thought I’d do a side-by-side comparison, out of sheer curiosity. This round goes to Ryan Seacrest of Idol, no competition. Carson Daly is stiff and awkward while Ryan is, along with Jeff Probst, the standard-setter for reality hosts. Last week, for example, featured a glitch in the Live episode when the stage wasn’t set up on time for a performer; Ryan covered with funny banter and self-effacing humour. And while his fakeouts are crueler than any other on TV, he’s still the tops of the singing-competition field. In terms of legitimate rock and roll cred, this is an easy win for Idol. In terms of said rockstar’s value as a judge and/or coach, this is an easy win for The Voice. While Adam Levine has zero claim to superiority over the legendary Steven Tyler as a musician, he is a truly standout mentor, a sharp, honest and fair judge and just as funny with the one-liners as dopey Steven. This one’s a wash.
Christina Aguilera. No contest. Jennifer Lopez is beautiful and very kind (and far superior to the other women from Idol‘s judging history) but she’s afraid of being mean, which always makes for a bad judge. She also isn’t even a quarter of the singer Christina is. And while Christina can sometimes be a little defensive, she’s a very underrated coach on the basic level of how much she improves the vocal technique of her teammembers. She’s also not afraid to tell the truth, which is rare among female judges. Does anyone care about Randy Jackson or Cee Lo Green? 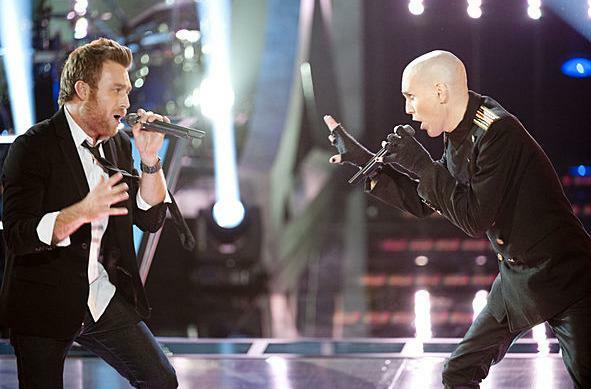 Honestly, I would like to know if there’s anyone who watches the show mostly for either of them the way lots and lots of people watch The Voice for just Adam or just Blake. I’m assuming not. Because Cee Lo is nutty and Randy is ridiculous. Randy is the last remainder of the judging panel that established the genre, but he was always the least important on said panel and rarely has any advice worth following. Cee Lo, on the other hand, did assemble one of the strongest teams of the year and has been choosing some really great songs for their voices, so he wins this one by a hair. Idol‘s got Jimmy, who gives vague (but refreshingly honest) advice to the contestants and provides the occasional laugh. But The Voice has a 4th coach and he’s one of the most popular so there’s no competition here. Blake Shelton wins. Because he’s funny in a smart-aleck grampa kind of way (“Again with the male strippers!… I don’t get the point of the stilts”), he’s a warm and really supportive coach, he pokes good-natured fun at himself, the other judges and the show as a whole, and he’s got that deep blue eyes+wavy hair+sweet smile+impressive height thing going on. Oh, and he has a hot, talented, funny wife who helps him mentor. Winner. Idol‘s got a rotating roster of guest stars who are sometimes helpful (Mary J. Blige!) and more often not. The Voice has the coaches themselves (actually helpful teachers with impressive industry careers) AND their friends who they recruit to help out with the “Battle Rounds”. Just everyday normal buds like Kelly Clarkson, Miranda Lambert, Alanis Morisette and NeYo- you know, just hanging out, giving life advice. My favourite (apart from Kelly Clarkson, who I will always always love) was Robin Thicke, because he was insightful, funny and helpful (and had a cute rapport with his buddy Adam). So, unless it’s Mary J. Blige week, I’m going with The Voice on the Mentor front. Jessica Sanchez isn’t as good as she’s reputed to be (nothing she does ever seems effortless), but she is good. Hollie Cavanagh is better than she’s reputed to be, so is Skylar Laine. The Voice‘s Mathai annoys me as a personality (seriously, Mathai, we get it, you’re cute, do you have to play it up so god damned much?!) and has shoddy intonation, but she was pretty solid/pretty good this week. RaeLynn is good but not superb (but definitely passably good and very sweet). Idol takes this round if only because the voices on their annoying small people are that much bigger (and, actually, two of the three are not at all annoying, unless Skylar is talking about guns). Powerhouse Erin Willett is my favourite woman on The Voice right now and Katrina Parker totally rocked “Tonight, Tonight” with Adele-like oldschool power. Kim’s pretty good too, taking on the impossible “Rolling in the Deep” to great effect (and pitch problems that apparently were only audible to the grumpy coaches). These are women with exceptional vocal power, the likes of whom have either been already unfairly eliminated from Idol or were never there at all. Hence, this round goes to The Voice. The Voice‘s “Battle Rounds” eliminated most of their cute boys with guitars (and some without) who were pleasantly good. Those left are pretty much just Tony Lucca (who is, as Christina said in so many words, really boring) and James Massone (whose allure I barely understand and whose singing voice is flimsy). Idol‘s got Philip Philips (the cutest of the “cute boys”) whose got an idiosyncratic style all his own, and Colton, who is my prediction for the win because he’s straight, super Christian, white, cute, a decent (but not threateningly good) singer and is reminiscent of that same guy who’s won every year since season 6 (that’s 5 YEARS of the same cute, white, straight boy winning). Don’t ge me wrong, Colton shouldn’t win- he shouldn’t really have gotten as far as he has already- but I think he will win. But then there’s Pip, the one remaining cutie pie on The Voice worth liking and the best singer of the “cute boys” across both series. So this one’s a draw, I guess. Erin Martin and Chessa both drive me crazy (though at least Chessa was kind of great this week and has some decent power behind her voice, when she’s in tune) . Karla, who is completely likable and a decent (though airy) singer, put me off so much with her idiotic attempt to sing “Airplanes” this week that she’s now in this category. At the moment, aside from Jessica who annoys me for no good reason, there are no annoying chicks on Idol. At least none as bad as breathy/whiny singer/model Erin and her pathetic “Walk Like an Egyptian” song choice (really?! ), so this round goes, easily, to Idol. This is a good season for this type, there are some badass girls singing for votes right now. The Voice‘s Jordis Unga is probably the weakest of them, though still very good. Elise Testone was so amazing singing Led Zeppelin on Idol two weeks ago that I’m choosing to ignore that she’s never been that good ever before or since. Team Christina’s Ashley is pretty badass, though I had no idea who she was until last week and Lindsey Pavao isn’t nearly special enough (and she most certainly isn’t better than sadly eliminated favourites Sera Hill and, the saddest, Moses Stone) but the Team Cee Lo member who’s there to wipe the floor with Lindsey and her goofy haircut is Juliet Sims, who I didn’t love until this week when her rendition of “Roxanne” blew the house apart. The Voice wins on Juliet alone. Heejun went in the wrong week (either he stayed too long or his excellent “Song for You” should have kept him at least one more week, but going out after that performance is just odd) and I was sad to see the great belter Erika Van Pelt go home early. But, otherwise, the tough cuts on Idol have been nowhere near as tough as the Voice ones. Part of that is because the coaches made some odd choices in “The Battle Rounds” (RaeLynn over Adley, James over WADE and Chessa over Angie, in particular) and because so many of the “Battle Rounds” were too close to call (Anthony literally could have beaten anyone but Jesse, Monique vs. Chris and Whitney vs. Kim were just a matter of style preference). That said, Sera and Moses were just plain stupid cuts (America! Learn to Vote!) and the fact that I miss so many great competitors must mean the pool was stronger to begin with (too many good singers remain to just call it bad taste). So this one goes to The Voice as well. Idol has lasers, full orchestra and gospel choirs and stuff, but The Voice has those things plus individualized set pieces and choreographed professional dancers, so The Voice wins. (Also, they have those fancy chairs). You can also vote by downloading the song on iTunes, which isn’t technically a production value thing but it is damn clever, money-making and will make it more likely that the winner is someone who will actually sell records. Of the categories that weren’t too-close-to-call, 9 went to The Voice and 3 to Idol. So, can we safely declare a winner in defiance of ratings and television history? I think we can, and we should: THE VOICE!